Hundreds of Tibetans are held in detention under risk of torture and China has increased security forces around a major monastery, with limited reaction from international leaders. Chinese authorities have tightened security around a Tibetan monastery in Sichuan province's Ngaba (in Chinese, Aba) prefecture which has become the epicenter of self-immolation protests against Beijing's rule in Tibetan-populated areas, according to sources. They have also detained a monk from the Kirti monastery and another Tibetan possibly in connection with the deadly self-immolation protests last week that brought to 51 the total number of burnings highlighting opposition to Chinese rule and calling for the return of the exiled Dalai Lama, Tibet's spiritual leader, the sources said. “Now the Chinese authorities have raised permanent posts of armed police at four gates of Kirti monastery and watching on the monastery,” said monks Lobsang Yeshi and Kanyak Tsering at Kirti's sister monastery in India's hill town Dharamsala, where the Dalai Lama lives. No immediate details are available about the security buildup around the Kirti monastery, which has been under siege for more than a year after Tibetans stepped up self-immolation protests mostly in the Tibetan-populated Chinese provinces of Sichuan, Qinghai, and Gansu. It is also not known whether more detentions will be carried out at the monastery, from which hundreds of monks were taken away by security forces mostly last year. “On August 28, two Tibetans were detained by the Chinese authorities in Ngaba. Those are Jamyang Khyenko, 60, of Kanyak village, Toe Tsik subdivision of Ngaba county, and Lobsang Sangay of Kirti monastery," according to Lobsang Yeshi and Kanyak Tsering. The detentions came a day after the self-immolation deaths of Lobsang Kalsang, 18, and a monk at Kirti monastery, and Damchoe, 17, and an ex-monk, at a site near the eastern gate of Kirti monastery and close to "Heroes’ Street" in Ngaba. Heroes Street is a main road in Ngaba town which has become the epicenter of burning protests challenging Chinese rule. "It is reported that he [Jamyang Khyenko] was detained on suspicion of making contacts with his outside sources but details are not known," the two exiled months said. “On the same day, Lobsang Sangay, 22, of Kirti monastery was detained and taken away from his room in the premises of the monastery," they said. Lobsang Sangay is a relative of Lobsang Kalsang, whose roommate Lobsang Palden at Kirti monastery was detained on the same day of his self-immolation death, they said. “At this point of time, there is no information about their current place of detention and condition,” the exiled monks said. Human rights groups have expressed concern over the increasing number of Tibetan detentions. The London-based Free Tibet said it "has grave concerns for the well being of the hundreds of Tibetans who we know are in detention following protests, often in locations unknown to their families, without any legal rights and at very serious risk of being tortured." “Tibetans’ fundamental human rights are being ignored by international leaders who are afraid of risking their relationships with China. 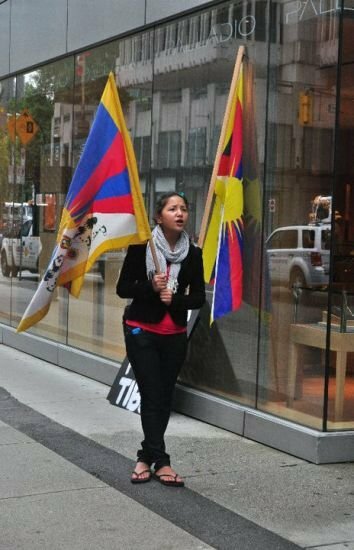 The time has come for each one of us to speak up and demand Tibetan freedom,” Free Tibet Director Stephanie Brigden said. In a letter dated Aug. 28 and signed on behalf of the ICT Board by Chairman Richard Gere, a popular Hollywood actor, and Vice Chairman Gare Smith, the group called on Clinton to take a "stern positioning in response to the deteriorating situation in Tibet that includes a continuing spate of Tibetan self-immolations, mostly by young people." “We ask you to engage your Chinese interlocutors in a manner that conveys urgent concern that the security crackdowns and re-education campaigns aimed at managing their Tibetan problem are, in fact, accelerating the deterioration of the Tibetan culture, steepening the decline in religious freedom, and contributing to a tragedy increasingly seen by the international community—as well as many Chinese in and out of China—as a potentially destabilizing failure in governance,” the letter to Clinton says.